In case you haven’t been paying attention to what is coming in iOS 11, the big story is that the iPad is about to gain a lot of pro-level features. Many of these will be iPad-specific features, not available on the iPhone. In fact, an iPad running iOS 11 will be halfway between an iPhone and a Mac. A new app, called Files, is basically the Finder. It is an upgraded version of the iCloud Drive app available in iOS 10, but now you can see files stored in other locations, such as Dropbox. You can move, delete and rename files. You can create folders. You can even see the Files app appear as an “open file dialog” in places, just like on a Mac. Multitasking now allows for windowed apps, taking up about on third of the screen as a floating window that can be on the left or right side of the screen, or even temporarily moved off the right side and brought back in. You can still have two apps share the screen, either 50/50 or 33/67. So now you can have three apps on the screen at the same time. There’s a Dock at the bottom of the screen. Very similar to the Dock on the Mac. In any app all you need to do is to drag up from the bottom of the screen and you’ll get this Dock with apps you choose, plus recently-used ones. You can switch between apps this way, or bring up a second app for multitasking. If you continue to drag up, you get to the app switcher, which now presents you with screens that look a lot like Mission Control on a Mac. If you pair up two apps on a screen, they stay paired here, so you can have a screen with Safari and Mail, for instance, and keep those together. You can drag and drop between apps now. So you can go to Photos, drag an image, and move to the Mail app and drag it into a message. Since 1984 the secret to a lot of advanced functionality on a Mac has been drag-and-drop. Now that will start to become true on the iPad as well. And those are just the major improvements. There are a lot of others too, such as a keyboard that allows you to swipe a key to access symbols and numbers, scanning documents in the Notes app, and easier home screen icon arranging. There’s even a way to video capture your screen now. There’s still plenty that Mac can do that the iPad cannot. Most of those things involve high-end apps which are only available on Macs, such as full-strength Photoshop, Final Cut Pro, and other pro apps. But the iPad equivalents aren’t that far removed anymore. Plus, if you add in the fact that the iPad is very light and portable, a touch screen, the Apple Pencil on the iPad Pro, and it has great battery life, then you start to see why it may be hard to choose between an iPad and a Mac in the near future. Thanks for the great article. I’ve been holding off on replacing my MBP (2012). Since I find I really don’t need any of the “PRO” functions, I’ll be taking a closer look at the iPad iOS11. Gary, While I do find some limitation to iOS, maybe 11 will take them away, as in pages and numbers. But I find most of the limitations in web sites because they seem to load a lighter version of the web site which also does not have all the functions, I mostly see this in bank and credit card sites. I have tried requesting the full desktop site but the function when load do not seem to work in IOS. Do you think this part will change with IOS11. This is the reason I still keep a Mac around. Bill: Most bank and credit card companies now offer apps that give you all of the functionality of the sites, and then some. Have you tried that? My local bank has an app that does everything their site does, plus allows me to deposit check with a photo, for instance. It is hard for a website to match the security of an app for things like this. My biggest disappointment with my iPad is that it doesn’t have any kind of mouse functionality. Trying to put my big finger at exactly the right spot on an email message or word-type document to select a spot to insert a character or correct a mistake is very slow and frustrating. Until iPad solves that issue I’ll stay with my iMac for serious work. I still love my iPad for reading the NYT and NG Mag. and doing light email. Any plans to add a mouse? John: There is already a solution for this, introduced with iOS 10. The keyboard can become a trackpad. Just put two fingers on the keyboard and the keyboard goes blank and you can move your two fingers around to position the cursor just like a trackpad on a MacBook. I have not come across the two-fingered cursor movement before. Many thanks for that Gary and the excellent work you guys do in educating us lesser mortals. I have just used the technique in composing rhis message!! Ray: You can already use a normal keyboard (since the very first iPad, in fact), plus Apple makes a special keyboard for the iPad Pro. You can’t plug in a screen, but you can AirPlay, and the larger iPad Pro has a pretty large screen all by itself. It think if you need something bigger than that, you probably do need a Mac/PC and not a tablet. As for a mouse/trackpad — iOS has no “cursor” so there’s no point in most cases. But for editing text, the keyboard trackpad works well, put an external keyboard brings arrow keys with it, so you have that. 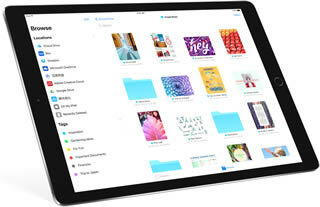 For the iPad to replace a Mac I would need more physical storage or a way to transfer data to other devices. Is it now possible or will it be possible to use flash drives or other storage media? I know Apple wants us to use the iCloud, but I work and stay at places where there is no WiFi. Jean: It is all about cloud storage now. No need to worry about “storage media” at all, right? Places without Wi-Fi will be rarer and rarer in the future. Plus, you can still work on local copies of documents with iCloud Drive. Just a little planning ahead to make sure you have the documents you want before you are out of Wi-Fi range. But I think that Macs/PCs will still be used by many who have special requirements. And that may be you if cloud storage can’t be used. Re: “Just put two fingers on the keyboard and the keyboard goes blank and you can move your two fingers around to position the cursor just like a trackpad on a MacBook.” At first, I took that to mean that I could reposition the insertion point. That would be very useful, so I tried the technique on my iPad (iOS 10.3.3). I could adjust the selection range, but I could not move the insertion point (or cursor). But then you also said that iOS has no “cursor.” Can you expand on this point. Thanks! Lucas: Yes, you can reposition the text cursor (insertion point). Start with the insertion point in normal mode, like while typing. Put two fingers down on the virtual keyboard and start moving them right away. If you wait with your fingers in the same position for too long, it starts selecting. I think that’s where you are going wrong. iOS has no cursor — there’s no arrow cursor that you can use to click on things, drag things, etc. This is very different from Mac/Windows. You have a text cursor, but that is only while typing. Still need a mac for much of the functionality of iTunes? Jon: What, in particular? On the iPad you can use the store, purchase music, rent movies, Apple Music, get podcasts, etc. There are some misc things you may be able to do in iTunes that you can’t do in iTunes/Music/Podcasts/App Store on iOS, but then maybe other apps can do them. Thanks, Gary! It works like you said. Hi Gary – appreciate your insights. I’ve been aware of the keyboard’s trackpad functionality for some time, but for extended use a mouse is far better. I’m a big Apple user (phone, tablet, laptop, watch) but wish Apple was more open to a 2-in-1 product like a Surface Pro. I think a lot of Apple users would appreciate a Mac hybrid option. OneNote doesn’t have the same writing to text functionality on 🍎. USB file transfer , external keyboard and mouse/trackpad are useful. ITUNES allows editing the Info of tracks (my playlists work on a Comment I add), importing music I got elsewhere (and may be unavailable from Apple). Also need to unzip files. But, exciting times!